I first published this article a year ago and the feedback was great. So I have decided to share a slightly modified version. Life is full of countdowns. We prepare for events or calendar dates that will make a numerical or biblical difference to our lives. Children, eagerly awaiting the arrival of a certain date, are often encouraged to count the number of ‘sleeps’ until the event, whether the event be leaving to go on holiday, celebrating their birthday or the arrival of an important person. Anticipation and conscious or unconscious countdowns usually go hand-in-hand. A significant event for many in the Western world is Christmas, marked on our calendars as December 25th. In the ‘run up’ (or shall we rather refer to it as ‘countdown’) to that date, a popular tradition, again presumably to capture the attention of children, is the counting of the ‘Twelve Days of Christmas’. I was fascinated to read that the counting should start on Christmas Day. It wouldn’t be nearly as exciting for children to begin counting the days only once they have received their presents! Another intriguing fact is that there are hidden meanings to each of the elements in the song starting ‘On the first day of Christmas my true love gave to me…’. In general, in the Western world, once the commercial and family frenzy of Christmas have passed, adults tend to focus on the lead up to New Year. Most of us have an array of ‘new years’ in our lives, marked by various religious observances and holidays or a birthday which also results in a new numerical age for us. A ‘new year’ can also come with a change in status, for example, the transition to being legally responsible, retirement age or becoming a ‘pensioner’. But not many are linked to ‘resolutions’ the way it is expected that people should make ‘new year resolutions’. In my opinion, few people actually enact their stated intentions, whether they be promises to themselves or to others. I’m advocating that people rather first reflect on their past, make meaning out of their reflections and then decide on possible actions. • 1 way in which you will honour the most important person in your life…yourself! • energise yourself through engaging more in those activities and experiences that have a positive influence on you? May 2019 be a year filled with good health, great happiness, peace and prosperity. Oh, and have loads of fun doing the things that energise you! Life is full of countdowns. We prepare for events or marks on the calendar that will make a numerical or biblical difference to our lives. Children, eagerly awaiting the arrival of a certain date, are often encouraged to count the number of ‘sleeps’ until the event, whether it be leaving to go on holiday, celebrating their birthday or the arrival of an important person. Anticipation and conscious or unconscious countdowns usually go hand-in-hand. A significant event for many in the Western world is Christmas, marked on our calendars as December 25th. In the ‘run up’ or shall we rather refer to it as ‘countdown’ to that date, a popular tradition (again presumably to capture the attention of children) is the counting of the ‘Twelve Days of Christmas’. I was fascinated to read that the counting should start only on Christmas Day and that there are hidden meanings to each of the elements in the song. However, I don’t think it would be nearly as exciting for children to begin counting the days only once they have received their presents! 1 way in which you will honour the most important person in your life…yourself! energise yourself through engaging more in those activities and experiences that have a positive influence on you? May 2018 be a year filled with good health, great happiness, peace and prosperity. Oh, and have loads of fun doing the things that energise you! One of the highlights of my regular trips to Australia is visiting Officeworks, a chain of office suppliers with 163 locations. I also enjoy reading their Workwise articles on their website. These are of particular interest to small business. It was fascinating to read a current article, published on November 2 2017, entitled ‘How to harness the power of email marketing’. Not only does this article provide information that will be valuable to any business, but there are worthwhile links to other websites and articles. Gary Eckstein, founder of Organicweb. This article contains up-to-date information provided by Gary Eckstein, the founder of Organicweb. For his Master’s degree at Henley-on-Thames Business School in the UK he chose to study market entry strategies of Online retailers and continues to build on his knowledge in this field. He is listed as one of Australia’s Mailchimp experts. As such he writes articles, consults and presents training either ‘in person’ or virtually. Read this article and you will improve the way you harness the power of email marketing. What are you doing to harness the power of email marketing? How can you improve the way you link your email campaigns to your marketing goals? How are you going about honouring your audience? What is it that your customers really need? In which ways are you using automation to deliver your results? How meticulous are you in creating your subject lines? What are you doing to use segmentation and personalisation in your campaigns? How are you using templates? We need to regularly pause and ‘take stock’ of various aspects of our lives. And by ‘taking stock’ I’m not referring to pilfering! We need to set aside time to assess our current status. If we aren’t sure where we are now, how can we go forward in our preferred direction? And how can we integrate continuous improvement? A story in Mark Eppler’s book, ‘Management Mess-ups: 57 pitfalls you can avoid (and stories of those who didn’t)’ is about the author seeing fishermen on the beach with their boats turned upside down. The weather was good and there appeared no reason why they weren’t out at sea catching fish, earning a living. He spoke to them and they explained that they were ‘scraping away the barnacles’. He still didn’t understand. 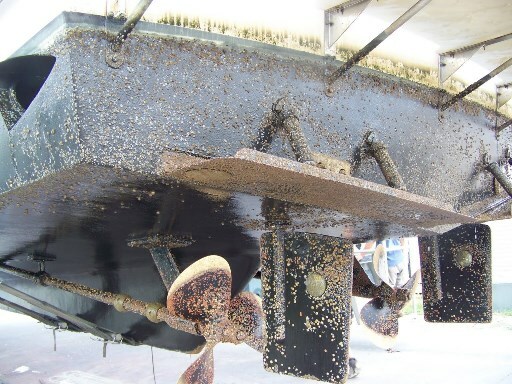 They elaborated that without their realising it, the barnacles under their boats, multiplied and multiplied. This meant that the boats were much heavier, less maneuverable and in some cases it cost 40% more fuel to reach the fishing areas. So they diarised one day a year where they sacrificed fishing and scraped away the barnacles that had built up over time. Our lives are just like that. And this applies to our private and business lives. If we don’t regularly and consciously check various aspect, we will become weighed down by excess baggage, be less maneuverable and it will take more energy and effort to each our goals. Let me give you an example: Over time I have enthusiastically recognised and optimised opportunities by adding new services. Recently I checked to make sure we’d put all on the ‘services’ section of our website. I was appalled! It was a mess! The barnacles had crept up on us. So, you can guess how I spent this weekend. Yes, I rewrote the ‘services’ section of the website with the support of Candice who does a wonderful job in keeping me on track. So, let me show you the updated current status of the services we offer. Of course, these will continuously improve as each client asks me to develop something new. And I have now diarised to check every three months to make sure the content is the best it can be. Effective leadership development is shows impressive results for organisations, teams and individuals. We also offer programmes designed to suit specific needs. As an experienced Executive Coach using integral methodologies Brenda specialises in helping CEO’s, professionals and others in senior positions to shift their ‘way of being’ so that they are able to turn their ‘stumbling blocks’ into ‘stepping stones’. Enhance Your Executive Skills is a new course which combines Executive Coaching, training and mentoring. Are you looking for a speaker who will adapt to meet the needs of your specific audience? Brenda has presented to a wide range of people on five continents. Her energetic talks incorporate her FLAG philosophy - Fun, Leadership, And (continuous improvement), Growth. Brenda has authored two books on personal networking and regularly writes articles on a wide range of topics. Over 135 free articles covering our areas of specialty may be seen by pressing the blog tag in this website. For more information on the services we offer, please contact Brenda on brenda@strategy-leadership.com or +27 82 4993311. 123: ‘Electric (wheel)chair’ or ‘Sportscar’? Life is full of challenges. This applies in the business arena and also in our personal lives. We can live a negative ‘story’ or through innovation change the situation creatively into one that not only is more acceptable, but has great benefits. We need to treat each ‘hiccup’ as a gift that could start us on a new, positive ‘story’. The old cliché, ‘if life gives you a lemon, make lemonade!’ contains a powerful message. Let me give you an example. My husband, Ed, unfortunately experienced a major stroke 30 years ago. To us he has led a ‘normal’ life since them. Oh yes, it has been filled with major challenges but we have met those with the help of a strong support structure - our amazing close family who are always ‘there’ for us, caring friends and an unbelievable team of doctors who make themselves available to us 24 hours a day. So, I repeat, this means that both Ed and I can lead ‘normal’ lives. We seem to go to hospital like other people go shopping! (Not quite!) Ed has just spent another 10 days in St Anne’s and had a major crisis during this time. So, obviously we were all despondent as the increased pain and further deterioration were debilitating. However, in the midst of this, Ed suddenly decided that he wanted a ‘sportscar’ and continued to search the Internet (his favourite hobby)! This confused everyone. However, he persisted in his ‘shopping around’. As a result, ‘Sportscar’ arrived two days ago, weighing in at 48 kgs. Ed immediately decided that his new companion is a ‘he’ and named him ‘Sportscar’. I tried saying, ‘doesn’t Mellow Yellow suit him better?’ ‘Yellow Submarine’ was also suggested. (The lesson here is that we should explore possibilities.) But no, the official announcement is that his name is ‘Sportscar’. That certainly sounds much better than ‘Electric (Wheel)chair’! 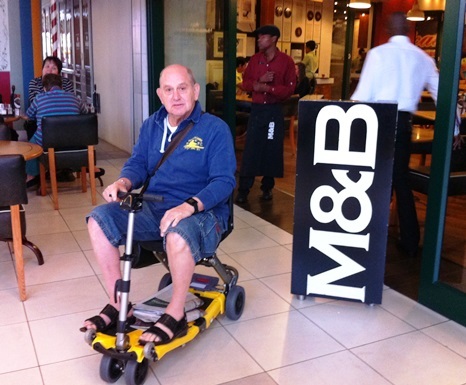 So, my BIG question is: how do we turn the ‘wheelchairs’ or even the ‘electric (wheel)chairs’ in our businesses or personal lives into ‘sportscars’? Have fun thinking about this. Some time ago, Glynis Horning, a South African journalist asked me what advice our ‘older generation’ could give the ‘younger generations’. That was a thought-provoking question! My answer appeared as part of an article in the Psychologies magazine. My first comment was that the younger generation lacks a sense of permanence. But, maybe that’s good? It was hard growing up in an era where choosing your first job was like a life sentence. ‘Nice people’ didn’t change jobs. It’s not like that now. Staying in the same job often gives the impression that you lack initiative. Being able to recognise and immediately optimise opportunities is one of the keys to success. Being flexible and able to operate in ambiguous conditions is essential in our current conditions which are often volatile. Conflicting attitudes often cause lack of understanding between the generations. And this is important because for the first time ever, we now could have as many as four generations in the workplace or organisation at the same time. An example given to me recently was that the ‘older folk’, those who had been working for the company for some time, found it hard to cope when a new ‘whiz kid’ was appointed as their leader. He ‘swept in and changed everything’. While the majority were still trying (somewhat reluctantly?) to become part of that change process, the leader moved on to another exciting position, leaving perceived chaos in his/her wake. I realised I was hearing one point of view. I would have enjoyed holding a conversation with the ‘whiz kid’! Young people, raised in an era of ‘don’t fix the printer, just buy a new one’ will certainly not place as much importance on ‘made to last’ as our generation did. Even our pens were ‘made to last’. Do you remember how we used pens that we dipped into inkwells at school. My husband tells the story of one of the boys in his class at school who was caught smoking. He had the desk lid lifted (yes, we used to sit at old-fashioned wooden desks!) was smoking and the smoke rose through the hole made for the ink well! The teacher saw this and immediately sent him to the headmaster’s office. Products, jobs, location, relationships have all become more disposable. And anything that is faster replaces that which is slower. A friend tells the story of how his grandfather, going on a business trip, used to go to the train-station to catch the train from his town to the city. If he missed the train, he came back a week later and caught the next train. His father on the other hand, in the early days would be taken to the airport and if he missed the plane would come back the next day to catch the next flight. Now, if my friend misses his ‘wedge’ of the revolving door, he becomes totally stressed. Everything has become faster. But has it become better? The younger generation could benefit from learning to appreciate ‘permanence’ - but then look at how much they can teach us about flexibility, coping with change and technology! Where there are differences, or where there are changes, there will always be perceived benefits and perceived disadvantages. In the ‘Handwriting on the wall’ (‘Who moved my cheese?’ – Spencer Johnson) we are reminded that we need to ‘smell the cheese often’. We need to scan the environment, recognise change and reflect on which opportunities are closed down and those which are opened – and then take appropriate action. 2. What is the main lessons each of those groups could learn from your generation? 3. Which products in your life are disposable? 4. Which products in your life are ‘made to last’? 5. What, if anything, is ‘permanent’? 6. How do you go about scanning the environment for change? 7. And how do you use that information to your advantage? We have another New Beginning ahead of us. But I don’t see a boundary between 2012 and 2013. Do you? Except, of course, there is one on the calendar! What should I stop doing? Unless there is ‘space’ in your life, the next question is meaningless. What should I start doing? We need to continuously stretch ourselves, build new pathways so that we continue learning. There is no room for complacency. What should I continue doing? Often we are so enchanted by the ‘stop’ and ‘start’ that we forget the importance of continuity. And it is not only at a time like this that we should ask these three questions. For example, we teach our small children that is important to complete the race they started, regardless of how well or how badly they are doing. They need to continue swimming, start thinking positively and stop worrying about the impact of their (poor) performance. Sometimes it may seem easier just to ‘give up’. I often think about the ‘cork bobbing in the ocean’. It has no impact on the direction it will take. The external elements dictate its future. It may one day get washed up on a beautiful beach. But the sun will eat into it, the sand will bury it and a dog may even come and chew at it. I trust that 2013 will be a year filled with good health, great happiness, peace and prosperity. Take the risks that will head you in the right direction. Be prepared to sometimes not be the best swimmer in that race. But please, please make sure your life has meaning, that you are living your ‘authentic self’ and ‘making the world a better place for everyone’. You are not a ‘cork in the ocean’. What do you need to Stop doing, Start doing and Continue doing? ‘Growth’ is an important theme in our exciting new 6-week ‘EYES’ (Enhance Your Executive Skills) course which combines individual spontaneous ‘Executive Coaching’ sessions with personal strategy facilitation and group training. The purpose of this unique course is to ‘kickstart’ participants’ performance so that they can begin 2013 on a high note. In the first three sessions the themes were Fun, Leadership, And (continuous improvement) and in the fourth session on November 1 2012 we encompass Growth. We need to see our business and private lives in context. Unless we fully appreciate our current status, how can we set goals or move forward to a new specific location? Participants have insightfully clarified their ‘touchstones’ and values and are currently projecting ‘resources’ to the desired levels for the end of 2013. This week each will establish vision and set relevant, appropriate and achievable goals and tactics. Crucial to this process is clarity on personal ‘critical success factors’. Energy is renewable. How am I managing my energy? In what ways am I building energy through conscious attention to quality sleep and rest, fresh air, foods, liquids, cardiovascular and strength exercises? In which ways am I honouring my body? How am I tapping into ‘the wisdom of my body’? How clear are my vision, goals and tactics? What am I doing to ensure that my behaviour is ‘forward focused’ on goal-directed behaviour? How clearly and timeously am I communicating my vision, goals and tactics to my teams (work and home)? How am I recognising and motivating those in my work and home teams? What am I doing to empower others so that they can reach potential? What am I doing to reward or ‘shine up’ myself? How am I honouring my ‘authentic self’ in promoting my ‘personal brand’? How am I continuously improving the way I operate in all domains of my life? Pegged against my current status and the status of those impacting on me, how am I ensuring that I continuously use my tactics to move towards my goals and vision? What am I doing to ‘create space’ so that I can grow? What am I doing to establish new ‘pathways’, learn new things (neuroplasticity)? How am I going to add value to my current qualifications? How connected do I feel to the universe? What practices do I engage in? How am I maximising the incorporation of my ‘touchstones’ into my daily life? How am I caring for my emotional needs? What have I done to ensure that ‘reach out’ is a default and that I ‘shine up’ others? How is ‘being kind to myself’ incorporated in my self-leadership? Who are the people I serve? How clearly have I identified them? What business, community and private roles do I play? Who are those people or entities who have power over me? What am I doing to minimise the impact of those who are toxic to me? How am I consciously assessing and meeting the needs of those whom I serve (where appropriate)? What am I doing to be of greater service to those whom I serve? How agile am I? How effectively can I recognise and optimise opportunities? What am I doing to improve my agility? What can I do to improve the speed at which I move towards positive opportunities and away from negative influences? What grounding practices do I regularly engage in? How consistently am I genuinely adopting an attitude of ‘what can I do for you’? How do I go about building and sustaining positive relationships in all aspects of my life? How am I ‘harnessing the power of collective networking’? What is my strategy for taking my networking to a higher level? What am I doing to build and sustain positive relationships? What does the term ‘federated’ mean to me and how am I incorporating? What am I doing to constantly ensure that I communicate effectively and at the right time? How am I making sure that my messages have been understood in the way in which I intended them? How constructively do I deal with feedback (given or received)? How am I using my voice? How am I integrating all aspects of my life? What should I be doing to find greater balance over all areas of my life? Reflect carefully on these questions. What other questions should you be asking? Record your answers and use constructively in setting your plans for the future. Build in tactics that will support your intentions and help you to be the success that you deserve to be. If you’d like further information on the training we offer, personal strategy, leadership development or executive coaching, please contact me - brenda@strategy-leadership.com, Phone: +27 33 3425432, Mobile: + 27 82 4993311. When facilitating ‘personal strategy’ during ‘leadership development’ sessions or developing a ‘three year vision’ during ‘networking tactics’ sessions, I like to set the scene by asking participants to imagine themselves three-years hence. Sometimes we prefer to take a one-year time frame. Life moves fast! What capital do you wish to have accumulated? What income are you generating on a regular basis? What opportunities are there for future growth? And how are you going to achieve this? How are you building your personal energy? How are you conserving it? How are you allocating or spending it? Where are you living? Describe. How have you progressed in the last three years? What new skills have you acquired? What new qualifications have you achieved? What are your goals for the next period? What daily means of transport do you have or use? Your personal brand is a resource. How have you built it? Yes, coaching is a resource. What have you done to make sure that you are exposed to the right coaching for you? Your personal network is a powerful resource. What are you doing to build and maintain relationships? 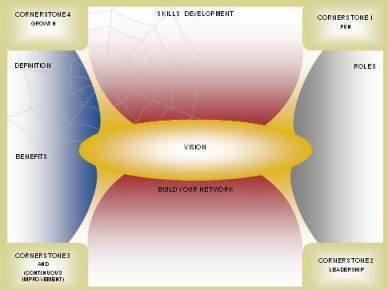 How are you improving your skills as a networker? What are you doing to expand your network in a meaningful way? How ‘up to date’ are you? Can you effectively incorporate the latest relevant and available technology where beneficial? Please add your own questions here. If you’d like to know more about our facilitation of leadership development, personal strategy, networking tactics, integral coaching or any of our other services, you are welcome to contact me - Phone: +27 33 3425432, Mobile: + 27 82 4993311, brenda@strategy-leadership.com.